Arie J: Thanks to my friend Nyny for writing this SHINee review, tell me if you like it! First time doing reviews on saranghaekpop! ^_^ Hope you all enjoy! The end of 2009 saw SHINee releasing yet another third mini album, Year of Us which I find to be considerably better than their previous second mini album, ROMEO. I feel like SHINee’s stepped up their game with this album indeed and title track song, Ring Ding Dong. 01. Y.O.U. (Year Of Us) – I absolutely love this song, I mean it reminds me of a late 80’s song that crosses over as a good start to the album. Pleasing and relaxing. And singing to YOU is like SHINee is addressing you. Ah! What a great feeling. 02. Ring Ding Dong [Title Track] – Very promising. The first time I heard Ring Ding Dong, I wasn’t so sure when Jonghyun started singing but when the beat kicked in, it was an instant hit for me. The use of African drums mixed with studio beats fits perfectly as the title track. 03. Jo Jo – This song is really made for when you step into your own dream world and you are “JoJo”. Or you just step into a shopping mall during Christmas and Santa’s Grotto is in there. I find this song pretty peaceful and perfect for when you want to be alone and need some quiet away from others. 04. Get Down – Rap battle between Key and Minho, at least – that’s what it sounds like to me. The beat sounds like a lot of things are going on, but it’s pretty much downright rap like in the 90’s. 05. SHINee Girl – I wasn’t too impressed with SHINee Girl. Again, this song reminded me of an old school song in the 90’s but it didn’t catch my attention when I listened to it but the song did grow on me to like since the chorus’ beat changes and gets faster. It has a Michael Jackson feel to it actually because Jonghyun opens up the song. 06. 내가 사랑했던 이름 (The Name I Loved) – Honestly the ballad is very soothing. You can really hear Onew’s vocals in this song. But if you ever ask me to talk about ballads, they must be an R&B Ballad. Otherwise I don’t have much to say. I think overall, SHINee did a fairly great job on this album, it brings across feelings, emotions and all-in-all for me, a dream world with some of these songs, not forgetting the change in genre and beats to make us dance or listen to them. So, my overall rating is 4/5. 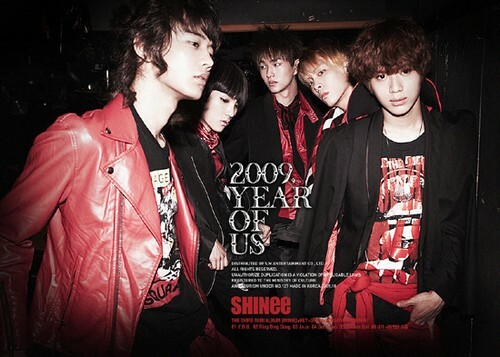 SHINee’s Lucifer is bound to be better than 2009, Year of Us but we shall see soon!